Discussion in 'Small Form Factor Systems' started by wahaha360, Sep 15, 2012. 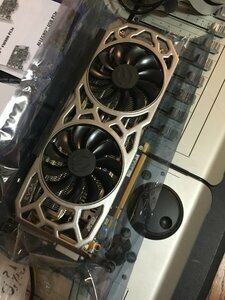 I have a pretty fine tuned Ncase system (see my sig) but I am looking to go up to a 2080 or 2080ti. How is everyone cooling the video cards today? 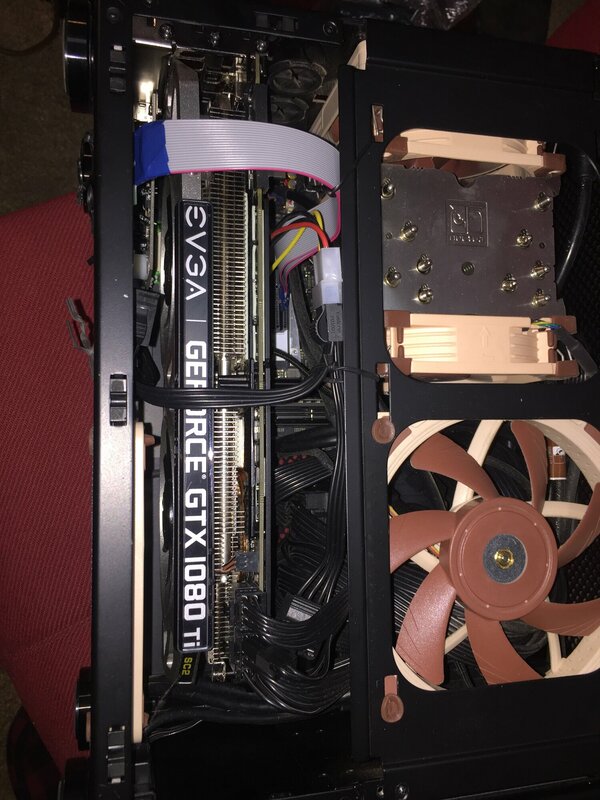 My 980ti with an accelero III has been such an ideal solution for noise and temps. 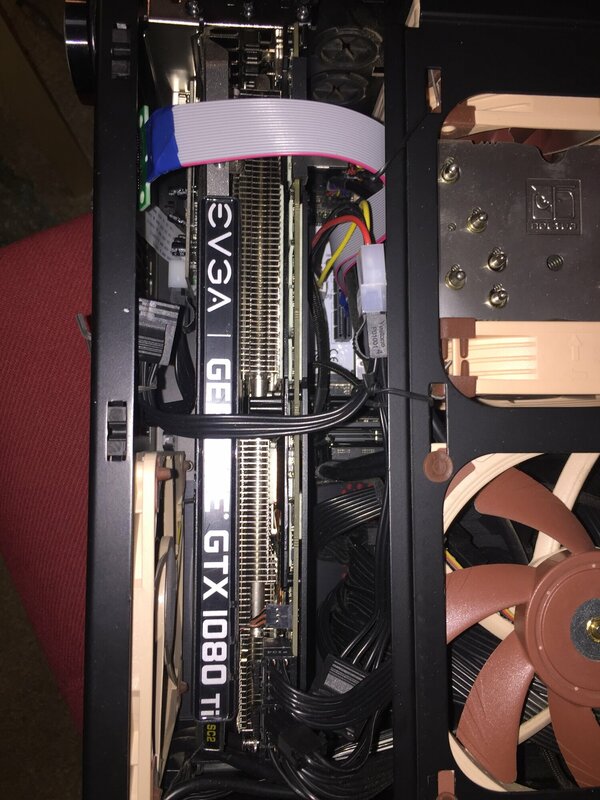 Or is the best bet to get a larger video card that fills the bottom but has a better cooling solution? 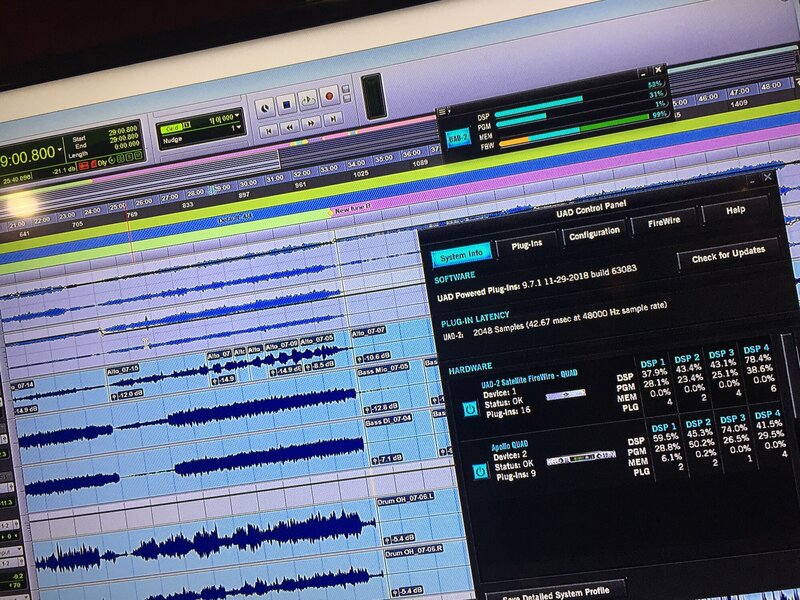 I've done the demcifilter thing and they filter very well, I just hate the super weak magnets that hold it. This is permanent and I can use an air compressor to blow it out. This is great, but doesn't is obstruct exhaust from the PSU? Even when idle and with the fan off, you still need heat to escape out the top. By the way, I have the Demciflex top filter and I have no issue with the magnets, they keep it firmly in place, so I'm puzzled by the issue you're having. I know they only fit one way though due the polarity, so maybe you had it flipped. Anyway, I would love to do this with my right-side panel, so I can have streamlined bottom-to-top airflow when I get the window panel, and not have air escape out the right side of the case, but I'm not sure the foam would fit there. Do you think it would fit or is it hard to say? It might obstruct the PSU exhaust. Not totally sure. I'm not too worried about it either way. Something was wrong with my top filter in that, no matter which way I oriented it, a good 30% would not remain attached with the magnet. I got tired of fighting with it. In regards to the right side panel, I just did a ghetto tape job with a sample piece of filter and it was able to close without an issue. Performance wise push is optiumn. But it's not a big enough difference. Is it really different? I would guess would be within 1c of each other. I'm really impressed with this case and the clc 240. 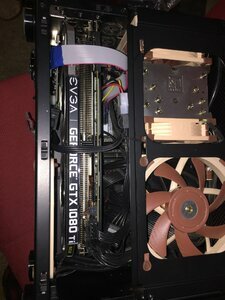 I have two noctua chromax 120mm on the radiator in pull config. Two under the rtx2070 set as intake onto the rtx 2070. The 9700k is set to 5.0ghz at 1.35vcore. CPU is delided. The rtx 2070 stock. Running 10 loops of timespy and the max CPU was 64C. GPU maxed out at 67C. Yeah it is. See M1AF results from testing a few pages back. Well first of all I dont understand what "Fans external mean"? Secondly the one saying "120x2 - fans internal, pull" is only .8 degress more. That is WAAY withing margin of error. 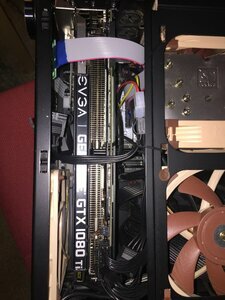 Dear all, this thread was really helpful when I was trying to get advice on building my NCASE, which also happened to be my first PC build. I always wanted to pay it forward by creating a build vlog or tutorial to help those who wanted to liquid cool their NCASE, and I finally created a step by step tutorial video. I am working on a separate video that focuses on some of the nuances in the NCASE (e.g. where I drilled holes to fit my GPU, though not necessary for all NCASE builds), and I will upload that soon as well. Granted, there are newer GPUs and CPUs available now but the principles still apply. Again, I really appreciate all your help and hope this video helps those who are interested in the super compact NCASE chassis but may not know where to begin. Thank you! Christyles, QuantumBraced, Neapolitan6th and 2 others like this. Fans external means they were mounted to the bracket. I included two pictures in the post. It is the one where you can see the fans. Fans external push won both tests by a small margin. It was repeatable. It really feels like you don't believe any of my testing and I'm not sure why. Sorry what?.. What makes you say that? I was commenting on doug_7506 comment about pull vs push would yield different results. That does not really have anything to do with you - from my POV. Maybe it does from yours? On another note: I am not sure I understand the whole external vs internal. I get that external means the fans are mounted to the bracket. But how can they be mounted external in a pull config? And how can they be mounted internal in a push config? Maybe I'm just sleep deprived. Regardless if you have the fan between the bracket and the radiator or the radiator between the bracket and the fan you can still rotate the fan to blow in either direction. Sure you can.. But then they arent intake fans if you turn them around. There are only two ways to configure them for intake - as I can see it in my mind. Either mounted to the bracket with the fan behind (push) or the rad mounted to the bracket with fans behind that (pull). I see, thanks very much for that information! Imagine the bracket is on the left. I think readers had different meanings associated with the words "push" and "pull". These images show that the intended meanings are to push air from the fan into the radiator or to pull air through the radiator into the fan. The confusion may be that that some people thought "pull" meant a fan pulled air into the case and "push" meant the fan push air out of the case, meanings that are better described as "intake" and "exhaust". Engr62, rfarmer and Nobu like this. I have updated the spreadsheet to be more clear. Additional suggestions are welcome. Now the corsair sf750 is available, so is it better to go sf760 gold or sf600 platinium? SF750 only comes in Platinum. I went from a Vega64 with a Morpheus II to a 2080ti ultra. The third one has been fine thus far, the first two died playing older games. It's such a tight fit against the bottom slim fans that I had to take the screws off the shroud. Temps are decent, and it's not too loud. Hakaba, MIDIBoss and darrpara like this. Very stoked about this! 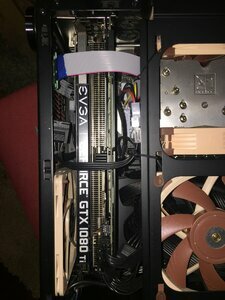 I built a custom PC in an Ncase M1 V5 about a year and a half ago. i7 8700k OC'ed to 5.0ghz, 32gb of OC'ed RAM, 1080ti SC2 from EVGA, Samsung 960 Pro 1TB m.2 NVME SSD, and it ran awesome! I primarily used it as a music performance machine for running all my .vst synths at insane resolution with tons of polyphony. It ran all my music software awesome with a usb audio interface. Secondarily, it was used as a gaming monster which was very fun with the fast CPU and insane 1080ti GPU. I loved it. 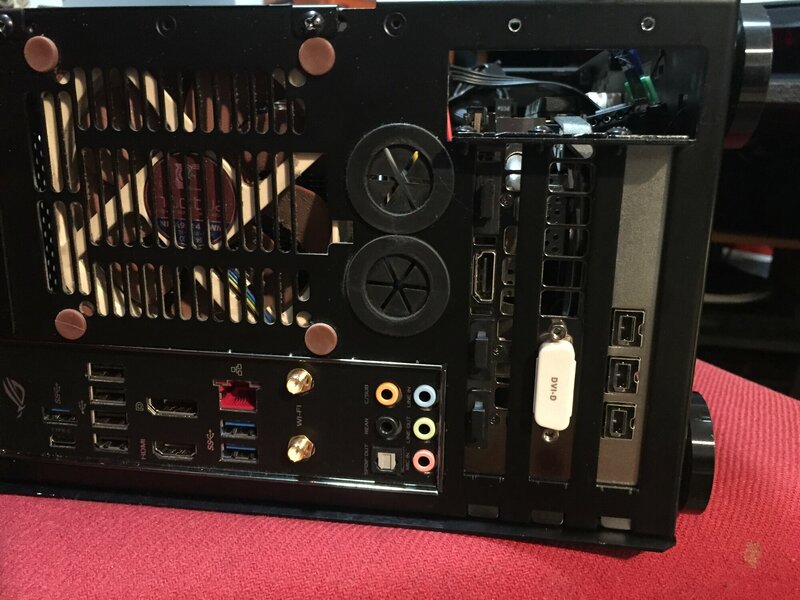 Did not want to give up GPU performance and also did not want to give up the small form factor of the NCase M1 ITX case, so I bought a Sonnet Allegro Firewire card, an m.2 to PCI-e adapter https://www.amazon.com/EXPLOMOS-NGF...words=m.2+pci-e+adapter&qid=1549681734&sr=8-3 and some PCI-e ribbon extension riser cables. Spent today figuring out how to absolutely cram all this in there! I had to remove one of the two fans I had bringing air in through the bottom of the case (who knows how much those were doing anyway), but it all friggin' worked! Thankfully there is an extra slot on the Asus ROG Strix z270-ITX motherboard for an m.2 SSD on the bottom of the board, so I just moved the SSD down there from the top slot. The peripheral power cable and ribbon routing was a real mind bender but it all fit and it all works. 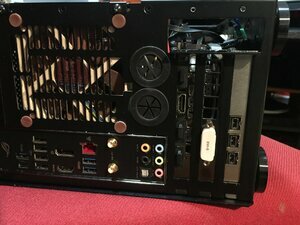 So for those who do not want to give up the beautiful SFF of the Ncase M1 but still want to add an extra PCI-e card to their computers for whatever other purpose, which in my case was legacy peripheral connection additions via Firewire, you can do it through the m.2 slot on the top of the board! I researched this for a long time before I did it but I still couldn't believe it when it all worked. Do you guys see any potential issues here? Any heat stuff to be worried about? Way to go! The fact that your motherboard has two PCI-E M.2 slots is great for this type of mod. It's not even a mod. It's been a while since anyone posted about using an M.2 to PCI-E adapter. I don't think there's much you can do about routing the PCI-E ribbon cable. Those shouldn't be bent or flexed unnecessarily. The black Molex power cable for the Firewire card might fit under the graphics card instead of over it, but really, it's not blocking anything now, so why bother. Thanks! Yeah, re: the Firewire card ribbon cable, as you can see, in order for it to work I had to bend it back over on itself and flip it up the opposite side of the GPU. The fact that there's really only a few MM of clearance between the FW card and the GPU front fans meant I thought it would be a little risky to route it that way. Didn't want a GPU fan blade to get caught in the cable. So I flipped it around after the connection and routed it under the FW card and up the opposite side of the FW card, as seen in the 2nd picture. Think that's ok? As it is now, it's not really putting much pressure on the ribbon cable connector on the FW PCI-e card connector end. There was a pretty good amount of space so that I don't think it's really stressing anything. If it fails, I can always get another one, but with the minimal amount of pressure on the ribbon cable I don't see it being a problem... Time will tell I guess. Good thinking on the peripheral power cable routing. I'll consider that if I have to open it up for any other reason! 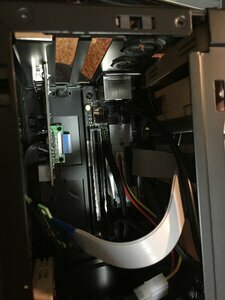 I guess the firewire card wouldn't work in the bottom m2 slot? Would think the cable routing would be simpler if it did, but of course it wouldn't be that easy. All that really matters is that it works now, good job! Thanks for the idea! I definitely thought about that, and technically it would work (PCI works on that slot) but unfortunately the only m.2 to PCI-e adapter I could find with good reviews has a PCI-e receiver that is too tall for the side of the case to be able to close, even if you bent the ribbon cable (which might cause other problems) the plastic PCI-e receiver is too tall to clear the case side closing on its own. Would've been a lot easier to go that route! Oh well. You're right, good thing it works as-is! That is nice. Before I started spec'ing out my NCase build I was making sure I could add a 10gig network card. So I did a lot of research and there are mulitple ways of doing this. Your approach is one of the easier to do and gets the job done nicely. Personally I couldnt do it that way as I wanted a 3 slot graphics card. But yea. You can use M2 ports (often they have 2 now a days), or just ditch the graphics card and use the PCI-E port.. But not a lot wants to do this and they would also be able to use a PCI-E splitter (bifurcation) - requires some internal rearranging of components.. But dont forget. All modern motherboards also have Wifi and that is attached with a M2 port also, so can you live without Wifi (I could) then that is also a go-to solution (wether it actually works I dont know). And lastly.. There is thunderbolt on the Asrock board (Z390) which also can also be used as a PCI-E port. This is the most elegang solution.. Also a lot easier to attach and de-attach if you move you rig around a lot but dont need to take the extra I/O with you. The wifi cards often use a different key on the m2 slot though, so you'd have to find an adaptor which also uses that key. If it has two notches on the slot, then you'll be limited to 2x pcie lanes (and compatible adaptors). Awesome. I was looking at the EVGA 2080ti Black and also the XC black. The black at $999 is very tempting compared to a high end 2080 non TI card which can be $850+. I plan to play games @ 3440x1440 but I normally don't overclock my cards too much. I'm more likely to undervolt them if anything. X2 might be cutting it close for three connections (~400MB max throughput, 1X pcie 3.0 is ~900MB max), but yeah probably fine in most cases. Firewire is 400 Mbps (bits) so that is 50MB/s (byte). And for the 3 is is 150MB/s.. I think an X2 port of 985MB/s*2=1970MB/s can handle that Even if it would be the 800Mbps variant. 1394b (beta mode) supports up to 3200Mbps (~400MB), dunno how many devices support it, though. Edit: yeah, I expected it, but after a lot of searching only found one device which had a beta connector (a bus analyzer, I think...website wouldn't load) and a few places to get the beta cables. You can fits the Radeon VII in the M1 without any problem. Nanook, Boil and rfarmer like this. What you are saying is not 100% true or.. It sounds like you just googled the speed of it. But not really knowing it.. So Firewire 800 uses a 9 pin interface (was made in around 2002). That same interface (cable) is used for the newer 2008 (cant remember the exact year) FireWire S3200 standard. But at the time of making FireWire 800 it was only on paper the 3200Mbps speed existed. FireWire 800 is 800Mbps - not 3200Mbps. To achive the 3200Mbps speed the devices needs to support the newer IEEE1394d/2008 specifikation. That is a lot newer and needs total new chips. You old FireWire 800 does not run at this speed. And as far as I am aware this newer 3200Mbps spec was only on paper. No real devices came with it. Apple (which was the biggest adopter of FireWire) stopped using FireWire and instead went with USB (3.0 I think it was). That is why some google result could tell you that the FireWire 800 interface (cable) could do 3200Mbps. But as said not real world implimentation was ever made. CPU is exhausting out the rear, rear fan is exhaust, looks like bottom front is exhaust also, but I can't see how the bottom rear is oriented. That would make all the air have to come from the front/side panels, but he doesn't have those in the photos. Ah, I see what you're saying. Yeah, that may not be optimal. 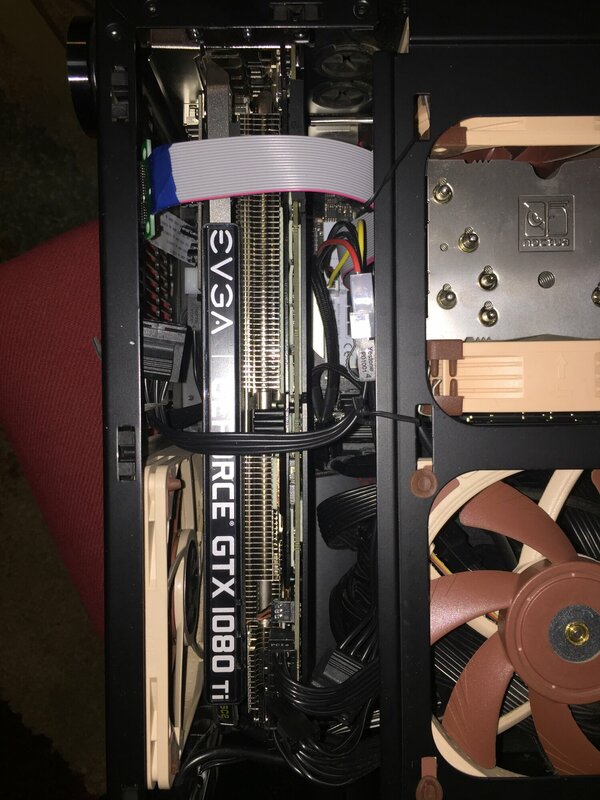 I finally got an EVGA RTX 2080 XC Ultra for my NCASE M1 v2 but I cannot keep the temperatures down! The RTX 2080 is fine when used for general browsing and watching Netflix (temps are in the 40/50s) but playing any sort of strenuous FPS shooters, the CPU temps shoot up in the 90s and after a while it just cuts out and my PC will not power back up until again, until I take out all the PSU cables out and back in. In my NCASE M1 now, I'm using a Noctua - NH-U9S 46.44 CFM CPU Cooler with some Arctic Silver - 5 High-Density Polysynthetic Silver 3.5 g Thermal Paste. I'm thinking of replacing these but what is generally regarded as the best quiet air cooled CPU cooler and best thermal paste? The CPU cooler has to be air cooled as I have no space in my NCASE M1 as I'm using the side bracket with two 3.5" hard drives. Thanks to all replies in advance!! Are you using the TG side panel? If not I'd say get an 240 AIO. That way you are cooling your CPU with cold air from outside of your case. Right now, your NH-U9S is trying to cool your 6700k with hot air from your gpu. Any air cooler will be fighting the same battle. If not, you can try to delid + switch to the Noctua c14s. That should buy you an additional 15C-20C of headroom. If you are uncomfortable doing that, Silicon Lottery will do it for $40 plus shipping. Look at M1AF post below on cooler results. AIO results are up. After the first few runs I noticed that the difference between a 15 minute run and a one hour run is like 1c so I went with multiple 15 minute tests. All tests began when the liquid temp was up to 30C. Max liquid temp after an hour never broke 40C. All tests were done with two NF-A12x25 fans at 60% - pump at full speed. Like Doug said, if you haven't already, you need to delid. I'm assuming you're still running the 6700k in your signature. That will help a lot. 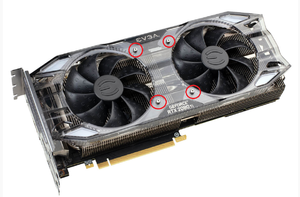 Next, remove these four screws and add two NF-A12X15 fans underneath the GPU as intake. The fans will not fit unless you remove the screws. After that, I would try to play with the fan configuration of the U9S since you want to retain the HDD bracket. I'd try 2 exhausting 92mm fans, one on the chassis and one on the right side of the cooler blowing from right to left. And if that doesn't yield good results I'd try to run them as intake, left to right. Adjust fan profiles as well. You might have to bump up the RPM. Lastly, I'd grab a better thermal paste. AS5 isn't a top contender anymore. Try some Thermal Grizzly Kryonaut, Gelid GC Extreme, or NT-H1.